There is no denying that cables are simply a hassle to deal with, especially when we’re talking about peripherals that we move around a lot i.e. headsets or mice. Many gamers opt for wired gaming mice instead of wireless ones, often simply to reduce the input lag which inevitably comes with wireless technology. If not that, then it is because of how expensive good wireless mice tend to be. 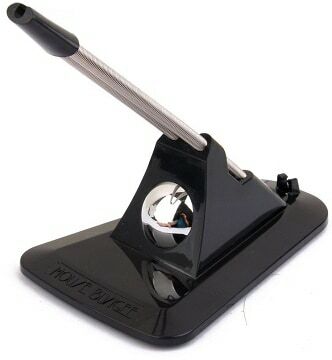 Now, if you’re looking for a way to make mouse movement smoother, then you might consider investing in a mouse bungee. These are affordable cable management products that are bound to make your life easier. 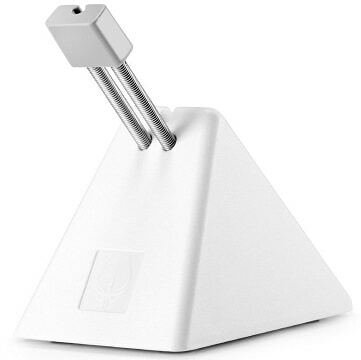 The first on our list is a simple budget mouse bungee from Meco. It is a bare-bones solution, made out of cheap-feeling plastic, but it is quite capable of getting the job done. It consists of a simple black plastic body and a metal spring arm, while the reflective surface on the front is purely aesthetic in nature. There is not much to say about this particular bungee, other than that it is a good choice for those looking for the cheapest product possible in this category. As long as you’re not expecting a remarkably sturdy product capable of weathering the ages, you won’t be disappointed. Next up is a mouse bungee from aBell, a more expensive but also a higher-quality solution than the above product from Meco. aBell’s bungee comes in three variants: two with a black body that differ only in terms of the clip color (red or yellow) and an entirely white one, which is arguably the best-looking of the three models. All in all, this mouse bungee is quite well-built, and it looks good to boot. The only issue is that, despite its weight, aBell’s solution is not the most stable one out of all the bungees currently available in this price range. Nonetheless, it remains capable of handling fast and aggressive mouse movements. Cougar Gaming is a brand you may or may not have heard of. They are an international company manufacturing gaming peripherals, including this one, which happens to be one of the best mouse bungees currently available. The “Bunker” bungee definitely gives off an air of quality. It is compact, light, its circular base takes up very little desk space, but the best of all is the patented Cougar Gaming suction pad. Namely, it is incredibly stable and will just not budge unless you actually try to detach it from the surface. So, if you’re looking for a good bungee that is guaranteed not to slide around your desk and make your wired mouse feel closer to a wireless one, then we can wholeheartedly recommend the Bunker. The only real issue with it is that some mice with thick cables (like some Logitech models) might not be compatible. Now, for something a bit different. This mouse bungee made by Enhance borrows from the Bunker’s design, but it makes several standout additions. First and most noticeably, there is the LED lighting. The bungee comes with either blue, red, or green LEDs, and all models have the identical black base color. But that’s not all – this bungee also doubles as a USB hub, as it features a total of four USB 2.0 ports, two on the front and one on either side. Now, naturally, a bungee could hardly include these extra features at the same price tag without cutting some corners. In this case, it’s the build quality. It feels a bit flimsy, and is hardly as stable as the Bunker. 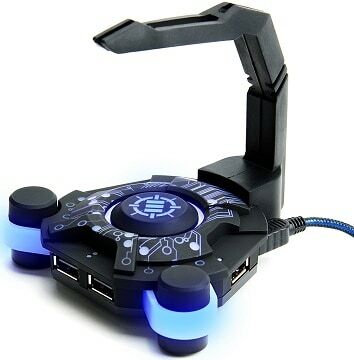 Nonetheless, it still makes a good choice for those who want a LED-lit bungee to complement their desktop aesthetics and/or those who could use the extra USB ports. 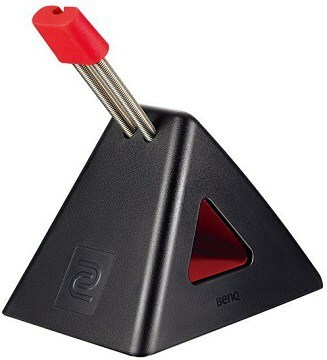 BenQ is hardly a company that you’d expect to see manufacturing peripherals such as mouse bungees, and technically, they aren’t. Instead, they merely acquired the Zowie brand which specializes in such products, leading to their name being stuck on everything Zowie makes. One look at the Zowie Camade, and you can tell where the inspiration for aBell’s bungee came from. The two are nearly identical in terms of design, although the Zowie one offers build quality which is quite a bit better, not to mention that it is more stable. 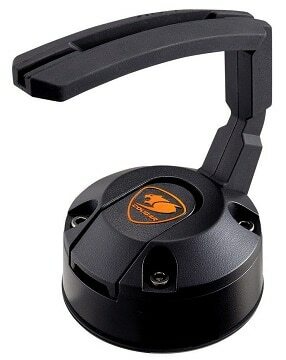 On top of that, the Zowie model also features a more adjustable rubber clip. There is no denying that the Camade is one of the better bungees currently available, but the main reason why some would be discouraged from buying it is the price. Namely, while the bungee is not that expensive overall, one can’t help but feel that the price tag is a bit too high for a no-frills bungee with no extra features. Following BenQ, we have another major brand that is hardly known for gaming peripherals – Cooler Master. But sure enough, big companies are branching out all the time, and Cooler Master has had a peripheral division for a while now. 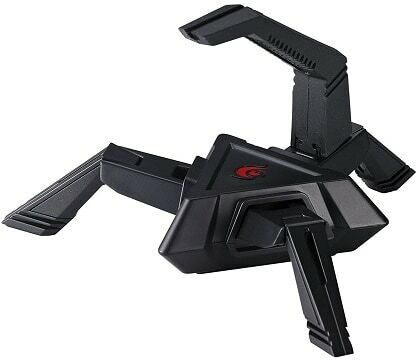 Regardless, the Skorpion is not a product that you’d easily associate with Cooler Master, as it has a very standout, gaudy design with three flexible legs constituting the base. The bungee is quite sturdy overall, seeing as it utilizes an iron core, hence the weight. This, combined with the rubber grip feet, make it a very stable bungee. Furthermore, the legs are detachable, which is an indispensable feature for those who need their bungee to be portable. The major downside to the Skorpion is, of course, the hefty price tag, which not many would be willing to pay, considering that there are cheaper solutions that work just as well. Apart from that, not everyone will find the somewhat over-the-top design appealing. 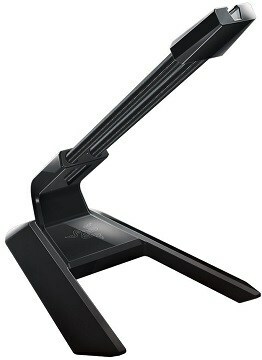 And finally, we have a Razer mouse bungee. As you surely know, Razer is known for two things: RGB lighting and high prices. However, this bungee comes with neither of those. The product is fairly minimal in terms of design. The exterior is entirely black, with the majority of its aesthetic appeal coming from the glossy surfaces. It is by far the most minimal-looking bungee out there, which is where most of its appeal stems from. It has no standout features, so the primary reason why you’d get it is for the appearance. The only glaring issue with the bungee is that the clip is made of hard plastic, meaning that there might be some cable chafing or compatibility issues with thicker cables. Why Get a Mouse Bungee? 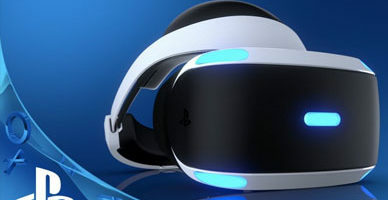 As mentioned in the introduction, bungees are cable management devices designed to make your gaming experience smoother, literally. 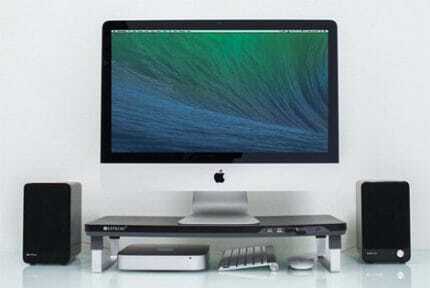 The mouse cable is placed in the flexible arm of the bungee which then allows for free movement of the mouse, with no risk of the cable getting stuck or chafed at the edges of the desk or anything else that’s in the way. So, if the aforementioned is a problem that you commonly encounter, then investing in a mouse bungee might be a good choice. Not only will it improve your gaming experience, but will also prevent the cable from getting damaged over time. With all things considered, we are inclined to give this title to the Bunker, made by Cougar Gaming. Mouse bungees have a simple purpose, and the Bunker fulfills that purpose admirably. Not only is it well-built and well-suited for the task, but it also presents excellent value. Furthermore, the patented vacuum suction pad is simply unrivaled. As a matter of fact, getting the bungee of the desk without the help of the onboard mechanism is rather difficult. Of course, any of the above-mentioned mouse bungees will make for an excellent purchase, so long as you keep their advantages and disadvantages in mind, of course.